An Illinois mother may have just saved the life of a Missouri man and it all started with a Facebook message. 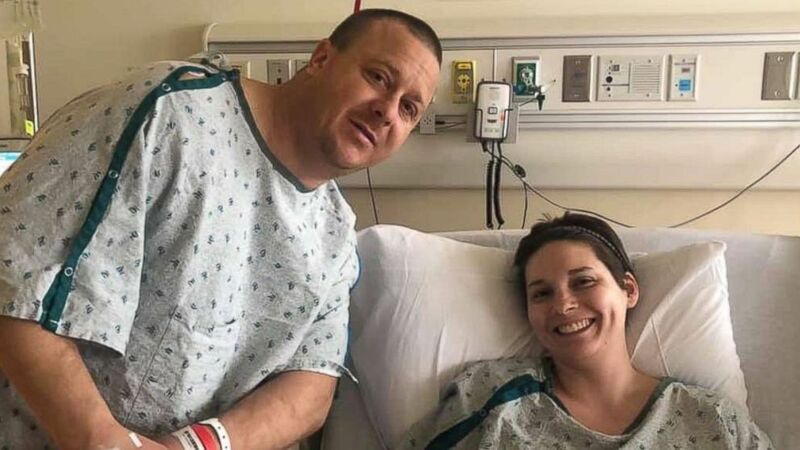 Abbie Dunkle, 35, of Highland, Illinois, donated her kidney to Ryan Armistead, a police officer from Missouri, on Jan. 22. Dunkle had never met Armistead prior to her selfless act. "She has gone above and beyond for saving my life and giving my wife and son the husband and father that they need and want to be around," Armistead told "Good Morning America" of Dunkle. "I know now that I'll be able to see my son grow up. Before that, I didnt know how old he was going to be before it beat me down. It was scary to think of." 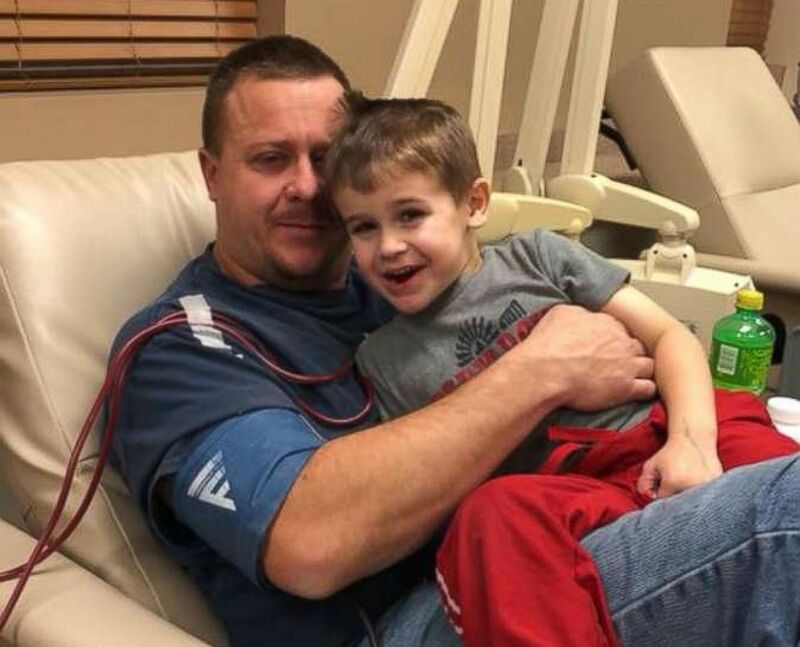 (Courtesy Ryan Armistead) Ryan Armistead, 33, is photographed with his son, Gregory Armistead, 5, in a Missouri hospital. Armistead, a father of one, was diagnosed with a rare auto-immune disorder called IgA nephropathy four years ago. The condition damaged his kidneys and doctors told him he needed a transplant. 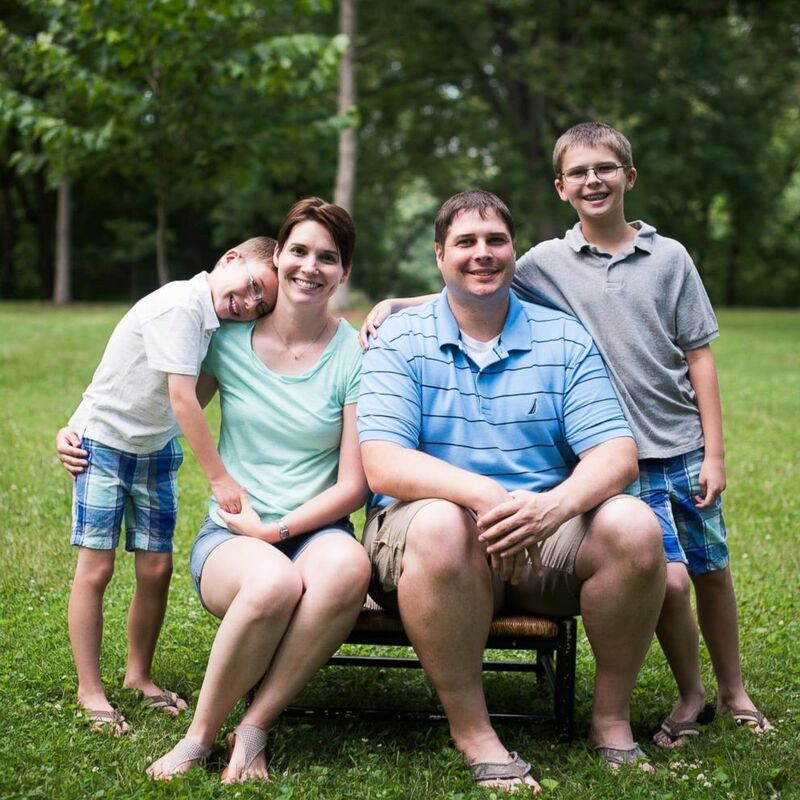 Armistead's wife, Jessica, then created a Facebook page in hopes of finding him a kidney. Jessica even made signs, asking for anyone with type O-negative blood to call Barnes-Jewish Hospital in St. Louis, and get tested to see if they're a match. 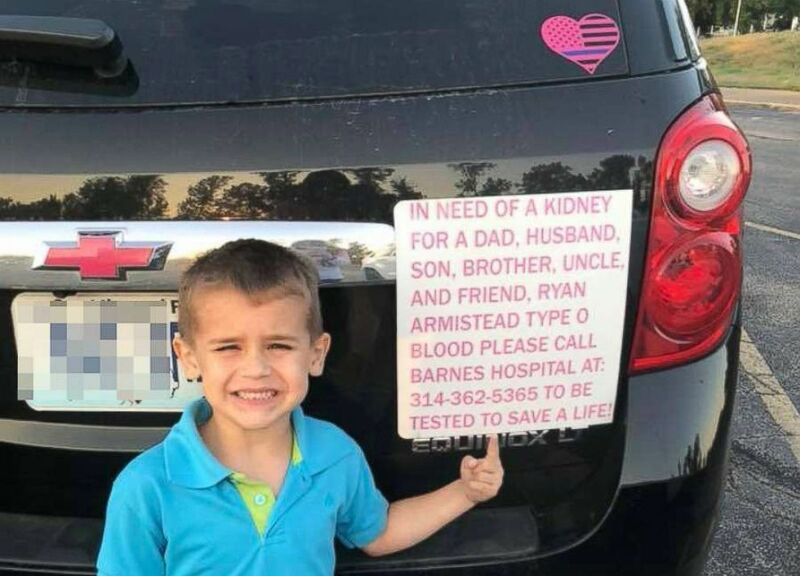 (Courtesy Ryan Armistead) Gregory Armistead, 5, is seen in an undated photo standing next to a sign on a car asking for perspective kidney donors for his father. Dunkle, a mom of two boys, said she always wanted to be a donor, but finally got the opportunity when she came across Armistead's story on the local news. The tearful moment was captured on video. "It was one of those things where I said well, I'll call the number and see where it takes me," Dunkle told "GMA." "He has a 5-year-old son, which is not that far in age from [my son]. This has kind of been on my heart to do for a while." (Brooke Lewis Photography ) Abbie Dunkle, 35, of Highland, Illinois, photographed with her husband Steve Dunkle and their children. With the support of her husband Steve, Dunkle got tested and in December, learned she was a match to be Armistead's kidney donor. She even had the surgery date booked before messaging him on Facebook where she introduced herself and offered him this gift. 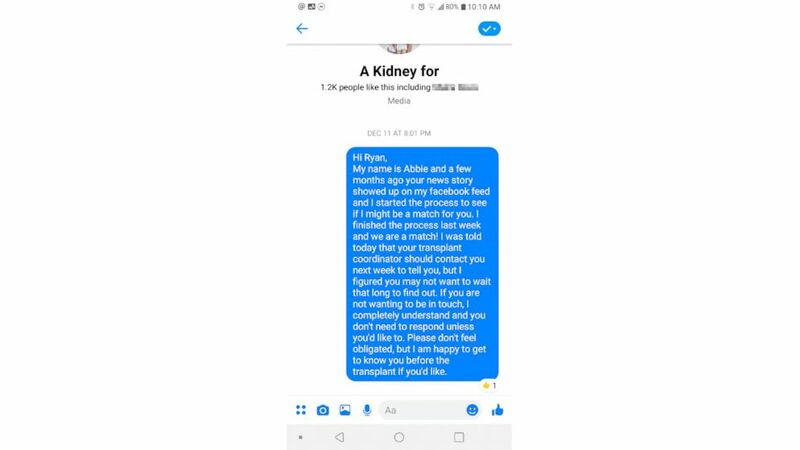 (Courtesy Abbie Dunkle ) Abbie Dunkle messaged police officer Ryan Armistead of Missouri, on Dec. 11, 2018 to let him know she'd like to donate her kidney to him. "I literally fell to my knees and started crying," Armistead said. "It had been such a long wait and hen Abbie [Dinkle] contacted me she had already done everything 100 percent." It's been two weeks since the surgery and both families have become fast friends. (Courtesy Ryan Armistead) Old Monroe police officer Ryan Armistead, 33, of Missouri, is photographed with Abbie Dunkle, 35, of Highland, Ill. Dunkle donated her kidney to Armistead, Jan. 22, 2019. "We like to say that we're family now," Dinkle said. "I think everytime I talk to him he thanks me again. He and his family are very thankful."